Flat Roman Shades. Design by Kristin Jackson at Hunted Interior. There is no more classic color combination than black and white. Refined, chic, and polished, this pair is at home in various forms in almost any style of home. Versatile Roman Shades in hues of black and white provide an instant dose of graphic interest to windows. No matter how you plan to use black and white in your design – more white, more black, black and white as a neutral – we’ll show you how black and white Roman Shades can spice up your space. Painted white walls and black window trim is very on trend right now, and white Romans with a black border pick up on both colors beautifully. This look gives your windows more visual weight than simple white shades on white walls, as shown in Kristin Jackson’s design above. Even if you don’t have black trim, a black shade border can pick up on other black accents like side tables, lamps, chairs, or artwork. 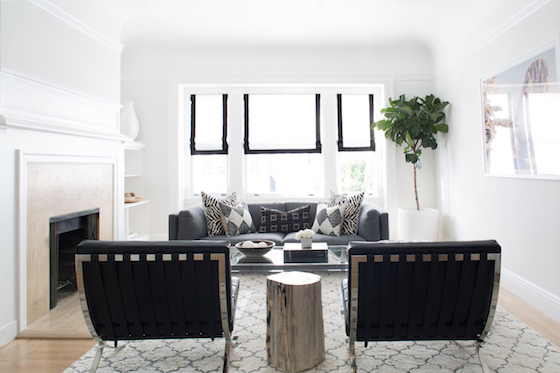 Caitlin Flemming’s living room design shown below features black and white shades on the otherwise clean white wall to balance the black leather chairs and fireplace. Cascade Roman Shades. Design by Caitlin Flemming at Sacramento Street. If you have a long room or an open floor plan, black and white shades can be used on windows throughout the space to give a cohesive feel. Then you still have the flexibility to create defined rooms and seating areas without making the area feel choppy. 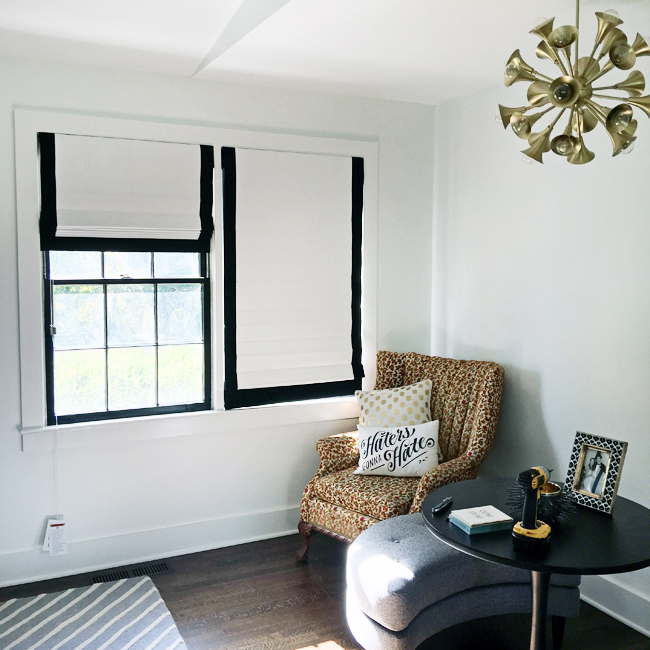 In a bold room with black walls, like this library by Shelby Girard, the same white shades with a black border tie the room together while keeping the windows bright. Black and white does not have to mean modern and cold. A black and white setting acts as the perfect neutral, as you don’t need to worry about any accent color clashes. 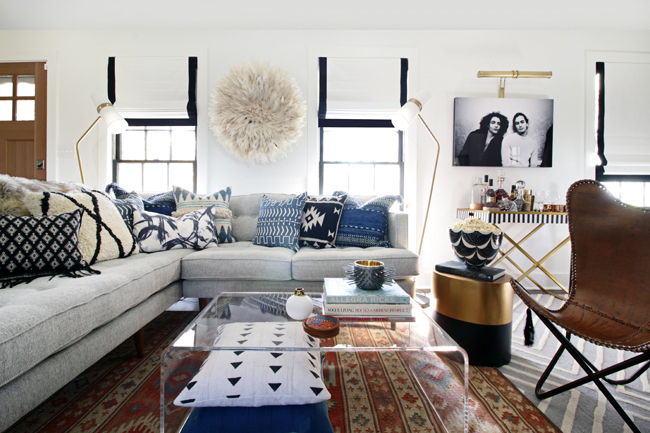 Try black and white shades in a room with colorful rugs, furniture, and pillows for a timeless treatment that can evolve with your style and taste. Prints can be daunting to use in practice, especially on a larger area like a window shade. You don’t want the print to overwhelm other aspects of your room’s design. Simple black and white geometric prints, like a stripe or check, balance out other black and white elements in the space without appearing too busy. We hope you feel inspired to try black and white Roman Shades in your next project. Order free swatches of any of our 550+ Roman Shade materials to test them out in your home. Talk to a Design Consultant by phone, email, or in the showroom about custom borders or choosing a print that will complement the rest of your decor.